This life-size felt mannequine makes it easier for young kids to visualize the complex inner workings of the human body. 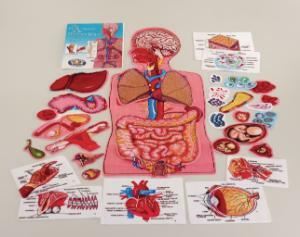 Designed under a doctor’s direction, this 34-piece set responsibly teaches health, exercise, anatomy and body funtions. The set includes the 34" high manikin and 33 pre-cut pieces including seven diagrammed pieces, eight diseases and reproductive system. Includes teacher’s manual.